On Friday, Johnny Cupcakes released an awesome new four t-shirt collection based on Marvel’s upcoming live action film Guardians of the Galaxy Vol. 2! While the film doesn’t premiere in the US until May 5th, fans can start showing their love for the Guardians of the Galaxy now by wearing one of these awesome new tees. The Guardians of the Galaxy Vol. 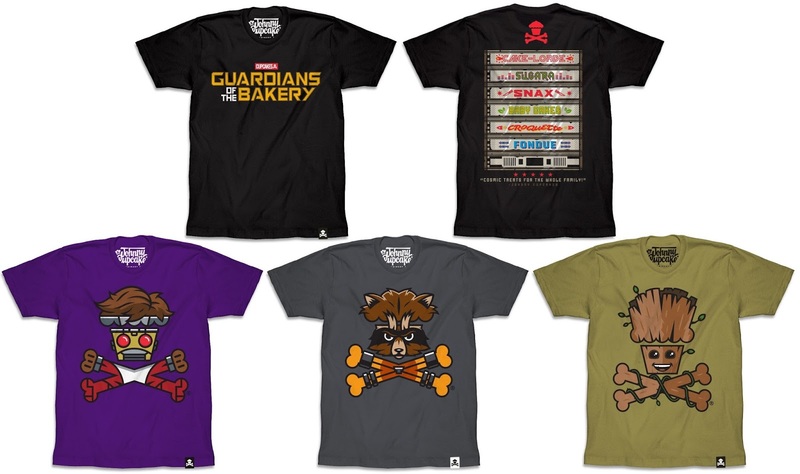 2 x Johnny Cupcakes T-Shirt Collection includes three character crossbones designs – Star-Lord, Groot and Rocket Raccoon – plus a really cool “Guardians of the Bakery” double-sided tee that is clearly inspired by the film’s logo and teaser movie poster. All of Guardians of the Galaxy Vol. 2 x Johnny Cupcakes t-shirts seen here are currently available for purchase at the Johnny Cupcakes online store in guys and girls styles, sizes S-XXXL, for $35.99 each.